Can we talk about using high-intensity workouts to deal with stress, please? It’s come up several times recently with a few of my clients and friends and I think it’s definitely something that we should talk about it on a broader scale. I absolutely think exercise is an excellent tool for managing day-to-day stress. And in the times we live in, it’s so critical that we have positive outlets for stress relief. It might go unnoticed when you’re consistently putting in the gym time day in and day out, but if you’ve ever been injured or otherwise unable to workout in your usual way, I’m sure you’ve developed a healthy appreciation for how regular exercise keeps you sane — I know I certainly have. It’s one thing to exercise regularly as a means of releasing those awesome natural feel-good chemicals and shaking yourself out of some funky emotional stuff. It’s another thing entirely to push yourself hard in your workouts daily as a way to avoid actually dealing with the reasons why you’re stressed out to begin with. Look, I’ve been there. A few years ago, I was going through some really heavy stuff that left me feeling trapped and completely powerless in my life. I was also exercising intensely every day, thinking that in doing so, I was doing my best to manage the stress. I didn’t know it at the time, but I was using these workouts to essentially numb what I felt, and ultimately, I was wearing myself out to the point where I didn’t have to feel the pain that my stress was causing me. What had started with the best of intentions became me inadvertently punishing my poor body for the mental and emotional stress I couldn’t otherwise manage. And my body put up with it … until it didn’t. I ended up with a stress fracture in my shin and a mental breakdown. Looking back now, it was actually a good thing I got hurt. Without the ability to go hard in my workouts while I was recovering, I was forced to face the things in my life that had become huge sources of stress — which is what I should’ve been doing all along. I made some tough choices during that time that ultimately led me out of the mess I was in and back into a much happier life — and a healthier relationship with my workouts. So What’s the Deal With Dealing With Stress? Well, let’s look at the physiology. While it’s true that not all stress is bad for you, physical stress and mental stress elicit the exact same stress response in your body. From a physiological perspective, stress is stress. Also, there’s no distinction between “good” or “bad” sources of stress. When any stress affects your body — whether it’s due to your boss being a jerk, due to you marrying the love of your life in two days, or your latest sweat sesh — your body releases stress hormones. stress hormones prepare your body for fight or flight by turning all systems to overdrive which means that your body might feel more capable than usual, so it’s really easy to overdo it and push your body harder than it’s actually ready for. Again, while it’s generally okay to blow off some steam in your workouts after a particularly rough day now and again, you definitely shouldn’t let it become your MO when dealing with copious amounts of chronic stress. If you’re supremely unhappy with some aspect of your life, it’s time to implement some meaningful change — not beat your body into submission until you’re too tired to feel anything anymore. Easier said than done, I know. But it’s the hard truth. In the meantime, remember that intense exercise doesn’t have to be the only tool in your stress management tool belt. There are many other ways of dealing with stress that aren’t so punishing on your poor stressed-out body. Go for a walk, take a mellow yoga class, meditate, play with your kids or dog, or read a book. When dealing with chronic, difficult emotions, sometimes it’s better to just be gentle with yourself. You don’t always control how much stress comes into your life, but you do control how you manage that stress and whether you voluntarily add more. It’s all about the choice you make. As the involuntary stress in your life increases, it might be necessary for you to decrease the voluntary stress so your body has a chance to manage the influx of stress hormones. The best way to deal with stress isn’t always to just pile on more stress. Great article. I will be sharing this with some of our clients who I know will really benefit. Thanks for the great advice, Alison. I hadn’t really thought about the possibility of over-doing it when working off stress. I typically follow up a really intense workout with something more mild, like walking or yoga, but I’ll definitely take this warning to heart. i love gyming, i have dedicated the past 3 years of my life to getting in shape and looking good. Really interesting post! We all know how amazing exercise can make us feel when we’re stressed but you’re right – there are limits to the body. If you only use exercise as the tool for stress management, it’s likely that you will end up injuring yourself. 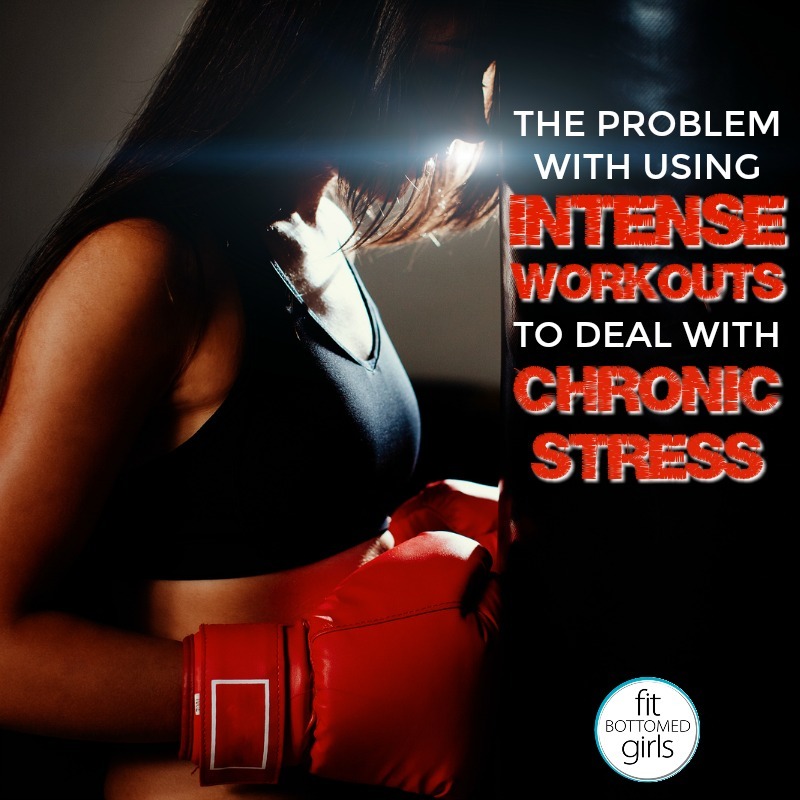 Then you’re stuck in a position where you can no longer use intense workouts when you’re stressed! I think you’re right – it’s important to get help from other sources and get to the root of the issue. Lots of good info in this post. I must admit that in the past I have used hard workouts as a “crutch”. I agree that you need to resolve the underlying cause of the stress rather than working out to simply make it feel better temporarily. Great post thank you for sharing this with us. This article is very useful to deal with the deal with the stress.